Older homes are drafty because insulation used in the past is not as effective as the insulation of today. The insulation was not as dense and settled over time. Thanks to today’s products, drafty homes don’t have to stay that way. Alpine Insulation can help. Alpine uses infrared cameras to identify cavities of missing insulation and then fills them. Alpine can also spray additional insulation over what is already there to increase the overall efficiency of the home’s outer envelope. Fiberglass (batts and blown-in): Fiberglass, which has been used to insulate homes for decades, is available as loose-fill/blown-in or batts. Fiberglass is made of tiny glass fibers and is often installed in attics but can be used to insulate walls and crawl spaces as well. Call (866) 261-1090 or contact us online today! Where Can You Re-Insulate Your Home? Attics: Attics contribute to some of the highest amounts of energy loss in the home. Proper insulation can help improve your home’s energy efficiency and comfort. Walls: Don’t let your conditioned air escape through the walls or near the windows and doors. 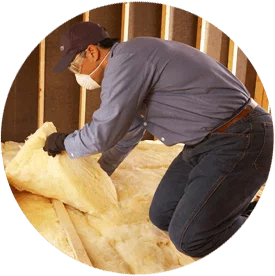 The experts at Alpine Insulation can help you insulate the walls to make your home more comfortable. Crawl spaces: Crawl spaces are another common area of heat loss in a home. We can help you seal any gaps in your insulation. Upgrade your home insulation today. Alpine Insulation is backed by the Installed Building Products brand, so you know that you can depend on us. Contact us online or by phone at (866) 261-1090 to get in touch with our experts today!